3 Wittle Birds: All I want for xmas is an electronic diary! All I want for xmas is an electronic diary! Last night Luis and I were looking through the Internet at possible Christmas gifts for our nieces and nephew. My one niece is 9 years old and is beyond her year of playing with dolls and Barbie's. She is very artistic and loves to draw, that's how I was at that age. So I began thinking of what I liked when I was nine. 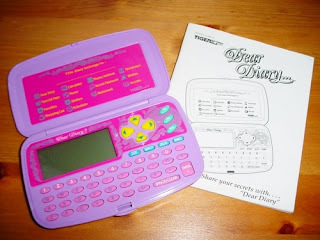 All I could remember wishing for was a Tiger electronic diary. Even now as I write this it makes me giggle. We began searching the Internet for one as Luis insisted on reminding me of how school girlish I was acting. Me: "They have to have electronic diaries, they are the coolest thing how could they just get rid of them." Luis:"Because today we have the Internet and all sorts of other cool electronics." As if I had been blasted to the past!I guess he is right, we have cooler things now that children are used to. They have their own cell phones, with high speed Internet and IM. I had one like this! This time of year really brings out the kid in me. It reminds me of all the toys we had at that age and almost allows us to be a kid again. What types of things were you interested as a kid? Thank you for the holiday season. I woke up this morning, well Bella woke me up this morning at 5:30. It seems she is waking up earlier and earlier. I looked out the window and it had snowed over night. It reminded me of the days when I was a child and I would hope so bad that it would snow so we could go sledding. In the mornings I would hop out of bed and like a fluffy blanket there it would be! I got that same childhood feeling again this morning despite the time. I can't wait to get our snow suits on and have a snowball fight!